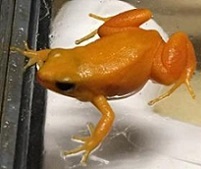 Golden mantella are small frogs around one inch long. They have a poisonous skin which they use to warn predators that they are poisonous to eat. They are golden - yellow in color on their dorsal side with darker colored legs. They are territorial and are known to fight for potential breeding sites and feeding areas. They do not have a specific breeding season and choose to mate during the rainy season usually after the rain. Males can be distinguished from the females by their call. 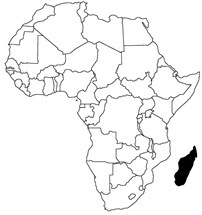 Conservation: this species is restricted to severely fragmented pockets of equatorial rainforest habitat in Madagascar. Their remaining habitat is currently threatened by subsistence farming, timber operations, and expansion of human habitation. This species is also captured for pet trade. Golden mantella are endemic to Madagascar, the island in black to the right of Africa.